Instead of a traditional floral vase, this couple used various chintz tea cups and saucers around their cocktail tables, reception tables, and lounge area--a neat use of pattern without overwhelming the eye. 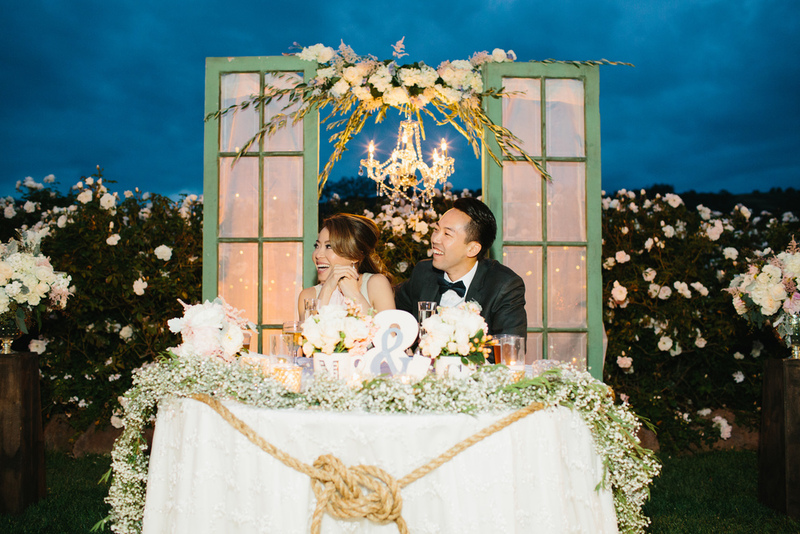 We could not get enough (and still reigns a top favorite) of Christie & Mark's lavish sweetheart tables. With Mint door backdrops, the sailor's knot, and the double ampersand, we'd say we took the cake on this one. Complete with sparkler send-off, this couple could not wipe the smiles off their faces. Neither could we! Special thanks to our partnering venue and vendors: Gerry Ranch, Command Performance Catering, Cotton Love Videography, Scratch Weddings,These Buds a Blooming, Circa Vintage Rentals, Casi Cielo, Mia Bella Chiavari, Anthony Martinez, Photocube, Grace Lin Hair and Makeup, SB Airbus, Sandman Security, and Pie Shoppe Photography.